Has anyone ever found a set to use in the winter that works and doesn't strain the electric system? And is certified for aviation use, of course! The CT electrical system is already up there and using something with a heating element that usually pulls more amps would be over limit. You can only have 16 continuous amp pull. Rotax says 20 amps in the book, but it is actually 18 peak and 16 continuous. Doesn't your cabin heater work well? my motorcycle heated vest pulls 7 amps...at max. Roger is correct. So long as you did not also try to run the landing light, you could take at most 7A out. But you will need to swap out the breaker on the cigar firestick for a 7Amp one as the existing one is just 4Amps. You don't need LOAs for ancillary things that just plug into the 12V port. That, my friend, is a great thought. I, too, have a heated vest - a Gerbing - and I never thought of using it in the plane! Do you need an LOA to replace a breaker with a larger one? The breaker is not ancillary. Sadly, it would not fall under one of the permissable preventative maintenance functions described in part43 Appendix A. Nowhere does that breaker or it's rating appear in the maintenace manual so maybe a mechanic would be willing to swap it out for a 7Amp one instead but an LOA would be best. The wiring looks to be 20 or 22AWG so 7Amps is the max recommended for chassis wiring applications. I wouldn't go higher, but the lighting coils can't take more of a load anyway. The heat in our aircraft is anemic. I have gone thru and made sure everything is taped up and verified that the valve on the firewall is operating correct. There is absolutely no air pressure coming from the outlets. If there is any, i can't feel it. I am not sure what else it cold be. Give me a call and let's talk through it. The heater should cook you out of the cabin if set up correctly. Just let me know what a good time is to call. Kent Johnson of Stanton MN, and I flew to UND where the High was -2. He flew all day ( we went up in the AM and back 6 Hrs later). He had a CTLS that had a FD "larger heater muff" installed ( factory has one) the temperature was around 47 degrees at our shoulders and in the high 30's against the back shelf. It was as warm as my old 172,182 ever were in fact warmer than the 172. You should not have a problem with the heat if everything is working. Kent had made sure to have all the holes around the wing root covered with film and also a baffle behind the seats to keep out the draft. Obviously door seals are a big area for drafts. You should talk to him about ways to make sure that cold WX operations are done properly. If your CT is sealed up properly and the heat distribution door opens all the way you should be able to fly in short sleeve shirt in the single digits. I'll fly my 2006 CTSW in short sleeves when it is 21F outside and only have the heat on 1/2 way. Door jam edges must be sealed. They are a big air leak. I use the soft foam that has a self stick backing. It is 3/8" x 1/2" and very soft and pliable. Same stuff that helps seals airleaks around your home. Ace Aviation has it or Home Depot. I apply it all the way around the door jam on the inside of the regular black rubber door molding. I use clear tape on all holes above my head including the sight tube ports and the wing spare holes. If you really need super cabin heat and closer take some 2" thick foam a little bigger than the opening behind the seat and cut to fit. You will be nice and toasty. I personally don't bother with the hole behind the seat with only 20+F temps. I own the CTLS you are talking about John. I haven't taken it up in below zero weather yet, but at +10 I was very comfortable. When the sun shines I shut the heat off. I have checked the exterior mounted valve and it is operating correctly. Anyone have a picture of the valve that connects to the air box? 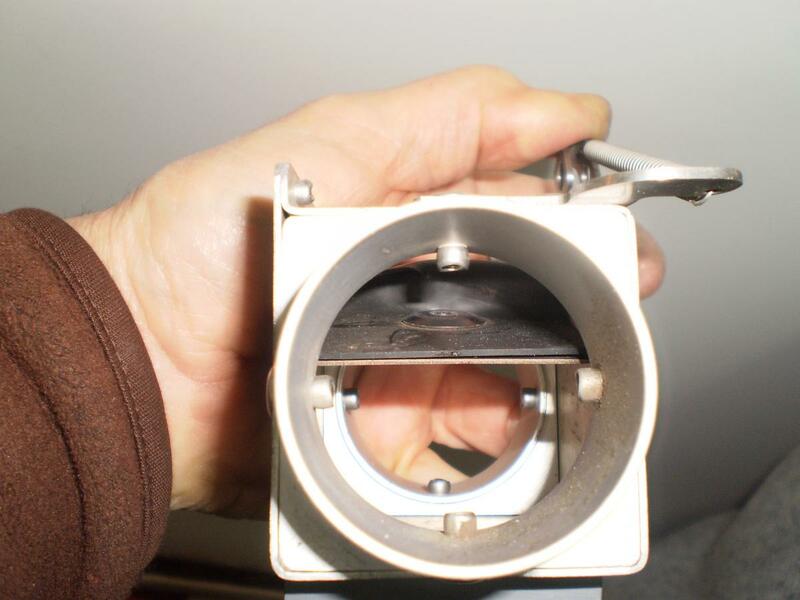 the picture show the 'valve' IN the heatbox there is NO other 'valve' for the cabin heat. There is a 'valve' at the airbox (below the air filter) but that's for the carb heat. Is UND still thinking of going with FD? That would be great news for FD. They would have to raise production. That would also make the CTLS less of a rarity around here. I know Roger has said it here before... the key is to close up all the leaky holes, like the ones above the door. Clear Packing tape is used by many, but others use a round plug of foam glued to a cardboard disk. The foam fits into the hold just tight enough to stop drafts, but is easily removable for inspection. Some aircraft may also have some drafts around the door, easily fixed with some automotive/home sticky-backed insulation weatherstripping. The heater definitely puts out plenty of heat, unless yours is defective. We've seen some where the flap that controls air is not working properly. In fact, in the CTsw, which didn't have the diffuser, the complaint was too much, too hot, all concentrated at your toes... ouch! (mine is this way, I'll get a diffuser someday). The doors are a huge air leak. they must be sealed for really good cabin heat. We've put clear patches over the holes where the fuel sight tubes are, and over various other sources of draughts, but it simply seems that there isn't enough hot air coming in through the heater inlets in the footwell. I have flown in a C42 Ikarus, Rotax powered and when you pull the cabin heat there you could fry eggs! Conclusion - something is wrong with the system in my CTLS !! It can only be a couple of things. 1. Your heater door in the engine compartment is not opening all the way. 2. The heater hose from the muffler to the junction box is torn badly or has come off. 3.The heater hose and or the heat vents inside the instrument console have come off or they are out of place. 4. you have something blocking the air inlet on the front of the plane or the inlet is mis-aligned. These are the only items that may lead to no heat or a reduced heat air flow.